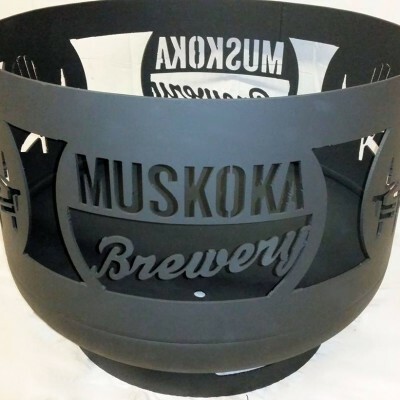 Our full size fire pit is 30″ in diameter and 24″ in height. This fire pit you can get either painted with a high heat resistant paint or order it with a rusty finish for a more natural look. All full size fire pits can be customized. We can take this design and then add either a saying or your family name in the top rim for an additional $50. If you wanted a brand new design, we will work with you to get that perfect design that suits you and your family. We will also include at no extra cost, a name or saying in the top rim. This is an additional $150 for a new customized design. Please stop into our showroom as we may have new designs not yet uploaded. 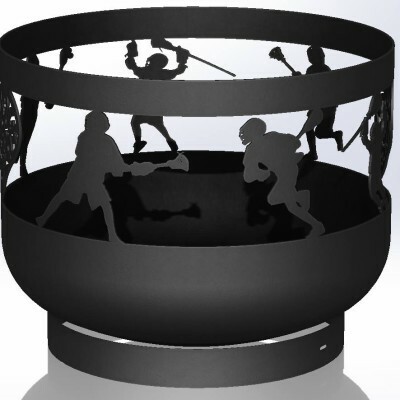 Lacrosse Theme - Full Size Fire Pit Our full size fire pit is 30" in diameter and 24" in height. This fire pit you can get either painted with a high heat resistant paint or order it with a rusty finish for a more natural look. All full size fire pits can be customized. We can take this design and then add either a saying or your family name in the top rim for an additional $50. If you wanted a brand new design, we will work with you to get that perfect design that suits you and your family. We will also include at no extra cost, a name or saying in the top rim. This is an additional $150 for a new customized design. 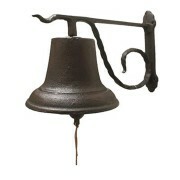 Please stop into our showroom as we may have new designs not yet uploaded. 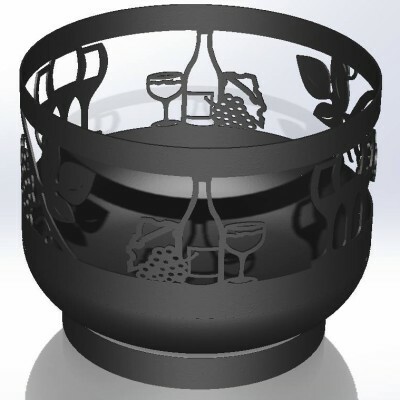 Wine Theme - Full Size Fire Pit Our full size fire pit is 30" in diameter and 24" in height. This fire pit you can get either painted with a high heat resistant paint or order it with a rusty finish for a more natural look. All full size fire pits can be customized. We can take this design and then add either a saying or your family name in the top rim for an additional $50. If you wanted a brand new design, we will work with you to get that perfect design that suits you and your family. We will also include at no extra cost, a name or saying in the top rim. This is an additional $150 for a new customized design. 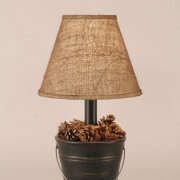 Please stop into our showroom as we may have new designs not yet uploaded. 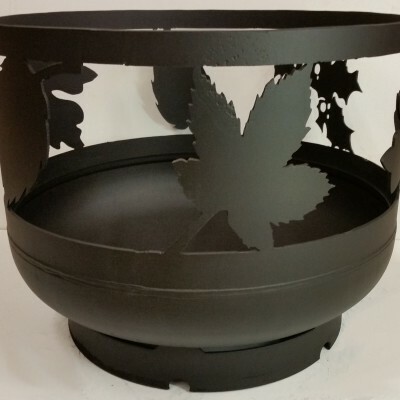 Leaves Theme - Full Size Fire Pit Our full size fire pit is 30" in diameter and 24" in height. This fire pit you can get either painted with a high heat resistant paint or order it with a rusty finish for a more natural look. All full size fire pits can be customized. We can take this design and then add either a saying or your family name in the top rim for an additional $50. If you wanted a brand new design, we will work with you to get that perfect design that suits you and your family. 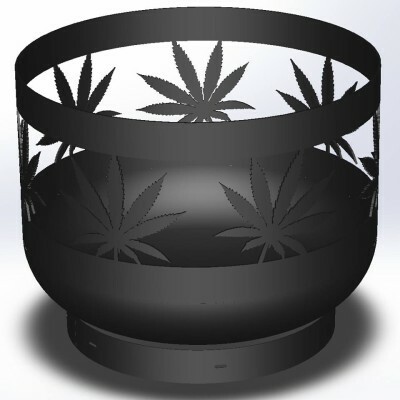 We will also include at no extra cost, a name or saying in the top rim. This is an additional $150 for a new customized design. Please stop into our showroom as we may have new designs not yet uploaded. 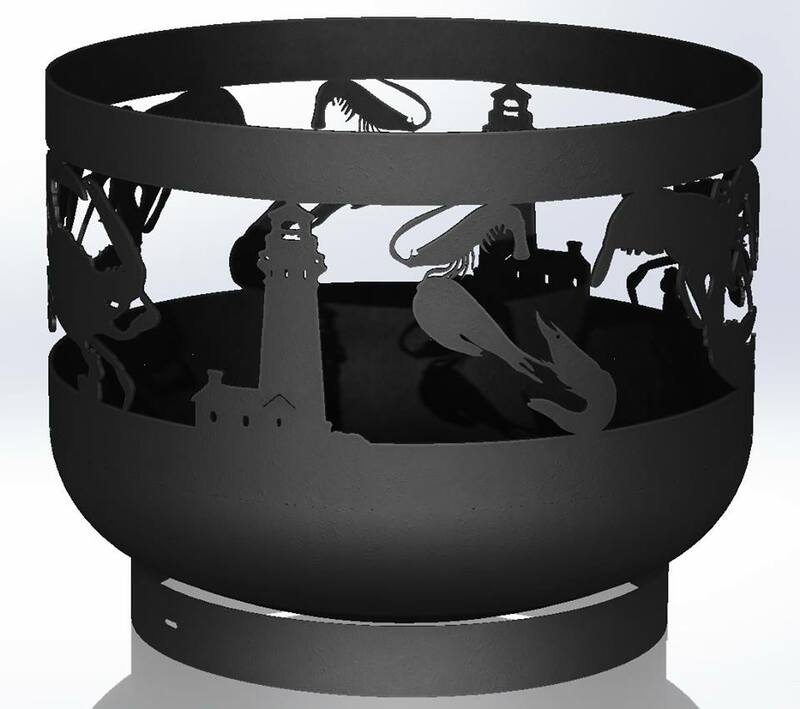 Breweries Firepit Design - Full Size Fire Pit Our full size fire pit is 30" in diameter and 24" in height. This fire pit you can get either painted with a high heat resistant paint or order it with a rusty finish for a more natural look. All ful size fire pits can be customized. We can take this design and then add either a saying or your family name in the top rim for an additional $50. If you wanted a brand new design, we will work with you to get that perfect design that suits you and your family. We will also include at no extra cost, a name or saying in the top rim. This is an additional $150 for a new customized design. 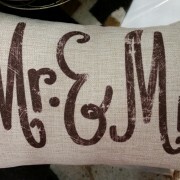 Please stop into our showroom as we may have new designs not yet uploaded. Snowmobiles Design - Full Size Fire Pit Our full size fire pit is 30" in diameter and 24" in height. This fire pit you can get either painted with a high heat resistant paint or order it with a rusty finish for a more natural look. All full size fire pits can be customized. We can take this design and then add either a saying or your family name in the top rim for an additional $50. If you wanted a brand new design, we will work with you to get that perfect design that suits you and your family. We will also include at no extra cost, a name or saying in the top rim. This is an additional $150 for a new customized design. Please stop into our showroom as we may have new designs not yet uploaded. 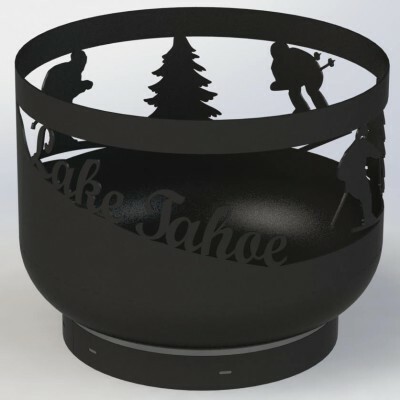 Downhill Skiers- Full Size Fire Pit Our full size fire pit is 30" in diameter and 24" in height. This fire pit you can get either painted with a high heat resistant paint or order it with a rusty finish for a more natural look. All full size fire pits can be customized. We can take this design and then add either a saying or your family name in the top rim for an additional $50. If you wanted a brand new design, we will work with you to get that perfect design that suits you and your family. 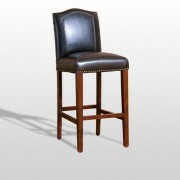 We will also include at no extra cost, a name or saying in the top rim. This is an additional $150 for a new customized design. Please stop into our showroom as we may have new designs not yet uploaded. 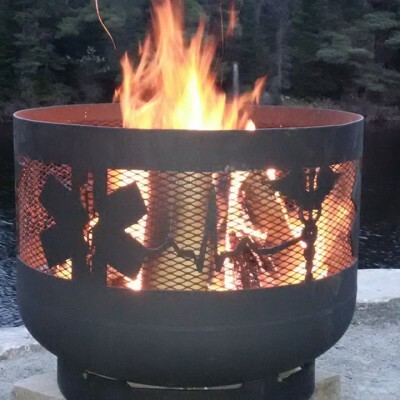 Loons Design - Full Size Fire Pit Our full size fire pit is 30" in diameter and 24" in height. This fire pit you can get either painted with a high heat resistant paint or order it with a rusty finish for a more natural look. All full size fire pits can be customized. We can take this design and then add either a saying or your family name in the top rim for an additional $50. If you wanted a brand new design, we will work with you to get that perfect design that suits you and your family. We will also include at no extra cost, a name or saying in the top rim. This is an additional $150 for a new customized design. Please stop into our showroom as we may have new designs not yet uploaded. The "Justin" - Full Size Fire Pit Our full size fire pit is 30" in diameter and 24" in height. 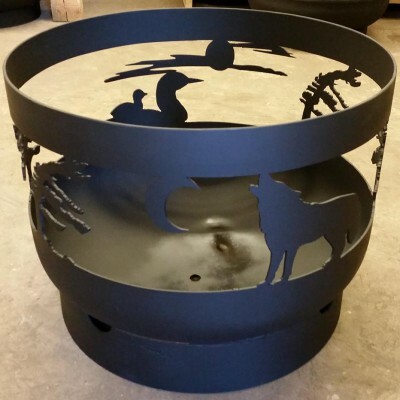 This fire pit you can get either painted with a high heat resistant paint or order it with a rusty finish for a more natural look. All full size fire pits can be customized. We can take this design and then add either a saying or your family name in the top rim for an additional $50. If you wanted a brand new design, we will work with you to get that perfect design that suits you and your family. We will also include at no extra cost, a name or saying in the top rim. This is an additional $150 for a new customized design. Please stop into our showroom as we may have new designs not yet uploaded. 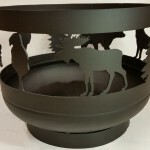 Custom Name or Saying in Top Rim of Full Size Fire Pit All full size fire pits are fully customizable. We can take any design and add either a saying or your family name in the top rim for an additional $50. Each of our fire pits you can get either painted with a high heat resistant paint or order it with a rusty finish for a more natural look. If you wanted a brand new design, we will work with you to get that perfect design that suits you and your family. We will also include at no extra cost, a name or saying in the top rim. This is an additional $150 for a new customized design. Please stop into our showroom as we may have new designs not yet uploaded. 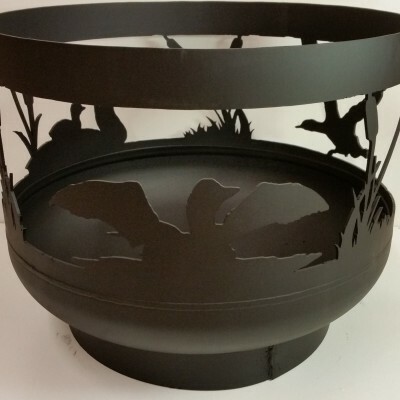 Full Size Fire Pit This design has a Fish jumping out of the water, Loons, Cattails and two Blue Herons. Our full size fire pit is 30" in diameter and 24" in height. 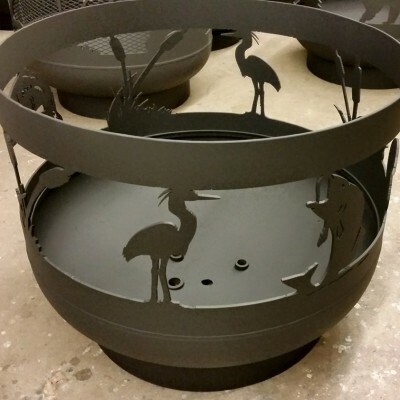 This fire pit you can get either painted with a high heat resistant paint or a rusty finish for a more natural look. Please stop into our showroom as we may have new designs not yet uploaded. 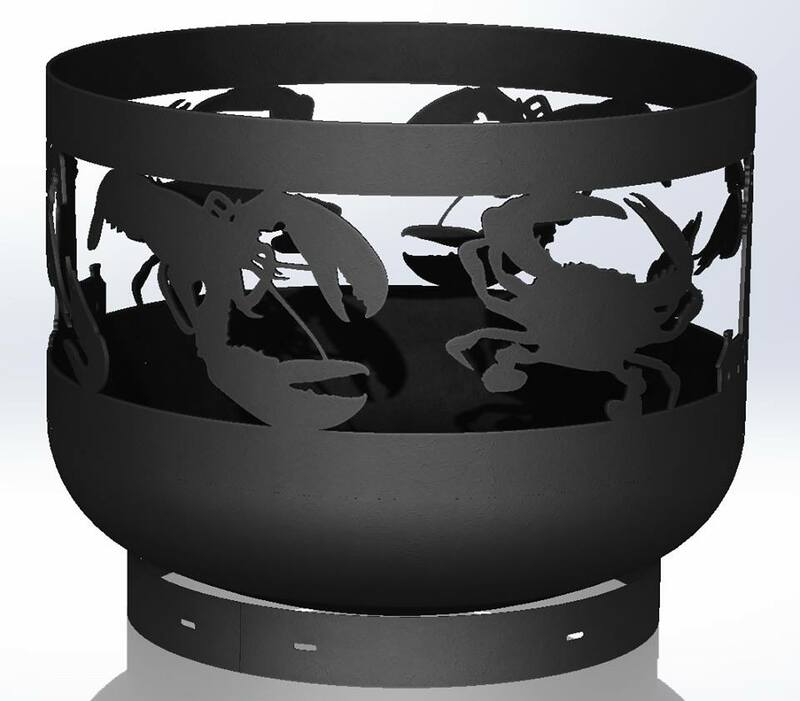 All fire pits can be customized. We can take this design and then add either a saying or your family name in the top rim for an additional $50. 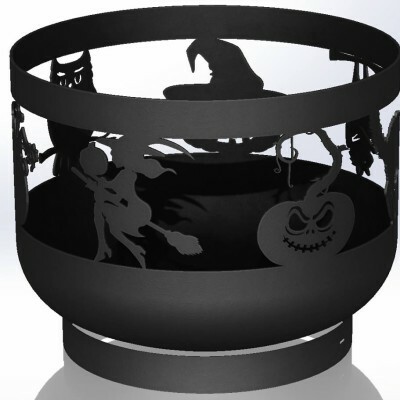 Halloween Theme - Full Size Fire Pit Our full size fire pit is 30" in diameter and 24" in height. This fire pit you can get either painted with a high heat resistant paint or order it with a rusty finish for a more natural look. All full size fire pits can be customized. We can take this design and then add either a saying or your family name in the top rim for an additional $50. If you wanted a brand new design, we will work with you to get that perfect design that suits you and your family. We will also include at no extra cost, a name or saying in the top rim. This is an additional $150 for a new customized design. 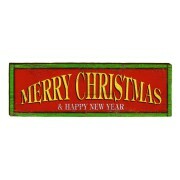 Please stop into our showroom as we may have new designs not yet uploaded. 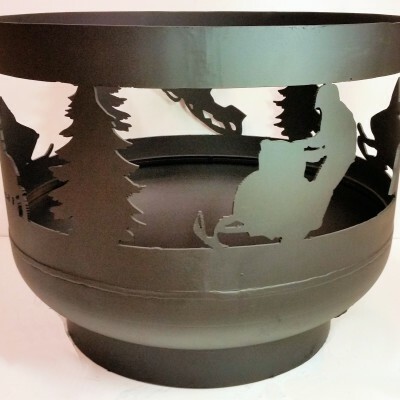 Loon Wolf Design - Full Size Fire Pit Our full size fire pit is 30" in diameter and 24" in height. This fire pit you can get either painted with a high heat resistant paint or order it with a rusty finish for a more natural look. All full size fire pits can be customized. We can take this design and then add either a saying or your family name in the top rim for an additional $50. If you wanted a brand new design, we will work with you to get that perfect design that suits you and your family. We will also include at no extra cost, a name or saying in the top rim. This is an additional $150 for a new customized design. Please stop into our showroom as we may have new designs not yet uploaded.